Kathy White, current PTA president for District 84, says PTA School Barbecue Day still happens monthly six times a year at the district’s three grade schools and one middle school. The Sloppy Joe recipe–handwritten on an old, dog-eared paper, is still the same one that the school used from the start: ground beef spiced with Open Pit barbecue sauce, mellowed with tomato juice and paste, thickened with a little cornstarch and seasoned with brown sugar, onion and garlic. Starting last year, healthier sides (pretzels and fresh fruit cups) were added to the menu. And with Hostess gone, the PTA is still figuring out what they’ll serve for dessert instead of Hostess snack cakes. “But other than that, the tradition is still very much the same,” says White. “It’s always been a bonding experience for the moms, who get together at 9 a.m. on BBQ days to cook the sandwiches from scratch.” While most of the kids at the schools still order Sloppy Joes on PTA BBQ Day, “the sandwiches are most popular with anybody who is an alum,” says White. “Every time I meet a former student who finds out I’m the PTA president, they always ask me about the Sloppy Joes!” Good news for any alums reading this? Kathy says if you e-mail the PTA , she’ll be more than happy to set some sandwiches aside for you. E-mail franklinparkpta@gmail.com to find out BBQ Day dates, and be sure to put “BBQ Day Request” in the subject line. 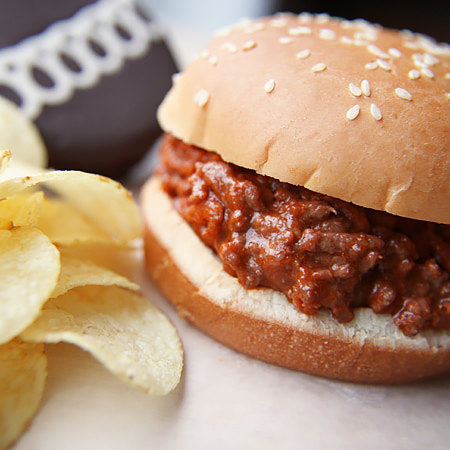 This classic “Sloppy Joe” has been served in Franklin Park, IL, schools on PTA School Barbecue Day since the 1950s. It’s a very meaty mix with just a bit of sweet and spicy tang and none of the minced vegetables (onions and sweet peppers) I like to slip in there. Jean Anderson, author of “The American Century Cookbook” (Clarkson Potter, 1997), ties the origins of the “Sloppy Joe” to a cafe in Sioux City, Iowa, where Midwestern “loose meat sandwiches” (sandwiches filled with seasoned ground beef sauteed “loosely” in a skillet) were the specialty. Mix together cornstarch with 1 cup tomato juice. Set near your cooking area to add when meat is ready. Stir barbecue sauce with remaining 1 cup of tomato juice and tomato paste. Set near your cooking area to add later. Sprinkle salt in bottom of very large skillet to keep beef from sticking to pan. Brown meat over medium high heat, in batches, until all is browned. Drain liquid. Skim off fat from liquid and discard; return meat juices to pan with the beef. Stir in cornstarch/tomato juice mixture and keep stirring until thickened. Pour in barbecue tomato mixture. Add onion and garlic powder to taste. Add brown sugar and simmer five minutes. Portion onto hamburger buns. 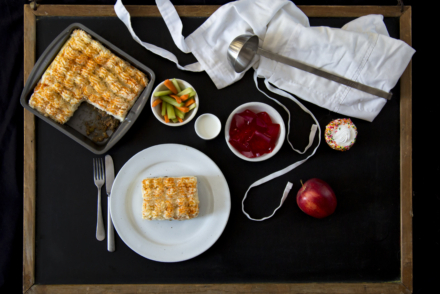 Wrap filled sandwiches in paper and pack into clean pan; keep warm in very low oven until ready to serve. Serve with chips, fresh fruit, chocolate snack cake and milk. The addition of cornstarch as a thickener makes this a pretty firm finished mix. Reduce the amount of cornstarch to 1/3 cup for a looser finished result.